This was one of those "only 5 ingredients" recipes, of which I've never had too much faith in if there isn't some main flavor involved. 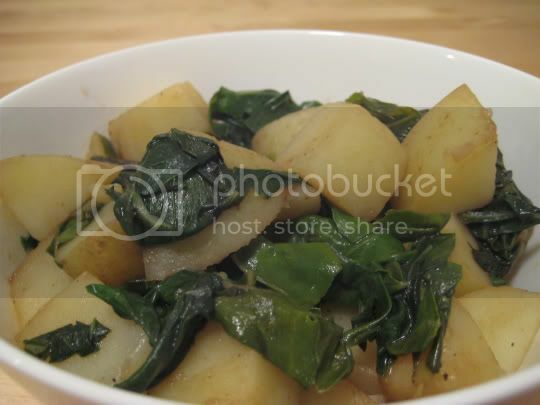 This was a very simple dish (read: BORING), with just potatoes, Swiss chard, garlic, and balsamic vinegar. It was hearty and filling, and the sweetness of the balsamic went nicely with the bitterness of the chard (this was my first chard experience). But...there's just not much else to say. Saute some chard, boil some potatoes, and this is what you get. Vinegar, salt, or any other spice can only do so much. Make again? Probably not. This was just lacking in more ways than one.